There was an email circulating around years ago, under various titles such as, “Think you had a bad day at work? Click here”. With a mouse click, your screen is filled with the image of a beaver, crunched under a large tree it had apparently gnawed down without the proper OSHA training. I can really relate. I once dropped a pick-up truck on my head. 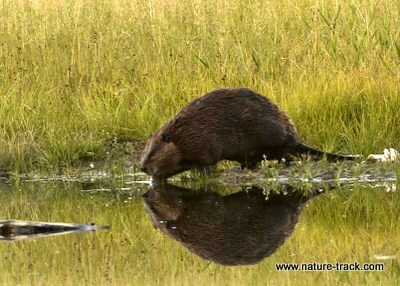 Beavers, Castor canadensis, at 30-60 pounds and up to 40 inches head to tail, are our largest rodent. They are one of our most widely distributed mammals as well, occurring in all 48 contiguous states, every Canadian Province and Alaska. There is a nearly identical version in the Old World as well. 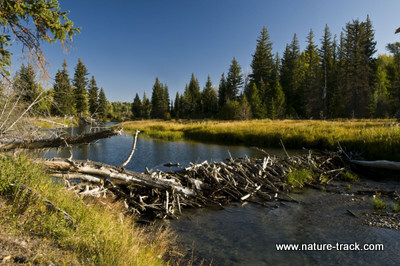 Beavers live in familial colonies in rivers, streams and wetlands. They construct lodges when possible. In larger rivers, they may live in holes they excavate in the banks. Since ponds are often locked in ice for much of the year, beaver store a winter's supply of food on the bottom of the pond and share the food all winter. In the early 1830s trappers pursued beaver for their thick dense pelts. Few trappers became rich because of the beaver but their explorations were in part responsible for the later colonization/taming of the west. Beaver trapping still occurs on a recreational basis, but beaver serve a far better function. Beaver are nature’s civil engineers and their efforts are invaluable in maintaining and restoring riparian habitat along creeks. The beaver is well adapted for a career in engineering, specifically, dam building. The dense dark brown fur is suitable for long hours in the water, as are the webbed hind feet. However, the real tools in the beaver’s arsenal are his teeth. These large, ever-growing teeth are well anchored in the head. Coupled with powerful jaw muscles the beaver uses its teeth to gnaw down some of its favorite foods such as aspen, willow and cottonwood. I have seen them tackle trees exceeding three feet in diameter. Beaver dams, like this one in Grand Teton National Park, provide tremendous ecosystem benefits for fish and for many species of wildlife. They also help to maintain critical habitats such as wetlands, riparian areas and aspens. Beaver build dams because they have to. Research has demonstrated that the sound of running water triggers beaver into dambuilding. They can’t help themselves. And their dams are true engineering wonders. If you don’t believe it, try disassembling one by hand. The combination of mud and sticks is incredibly strong. Once, I helped remove a large beaver dam causing some problems and it took 26 sticks of dynamite. Beaver have been used by wildlife professionals to restore habitat in many areas. If the area already supports a food source, beaver are simply live-trapped and released in their new homes. They immediately set about cutting down trees and shrubs and dragging them to the stream. As the dam grows, the water table begins to rise and a pond forms. If the beaver are allowed to continue their work, they may build dozens of dams that will capture sediment, encourage riparian vegetation and store water like a bank stores money. The process benefits often even the trees that are cut down. For example, aspen clones, highly valuable wildlife habitat, thrive when part of the clone is cut down and allowed to resprout. Within about 100 yards of the stream, beavers perform this service to the advantage of most species that utilize aspens. Willows and dogwoods also respond to beaver gnawing by sending up new vigorous shoots that moose, elk and deer find irresistible. HOWEVER, it doesn’t take much for a beaver to get on a human’s nerves when the two live in close proximity. A few bites from the trunk of a prized tree or a culvert that gets plugged overnight and floods a road, field or basement and people want to declare war on beavers. There are things humans can do though to help alleviate damage and to live in harmony with nature’s greatest engineer. First, if you have trees that beaver are or might want to chew on, a simple solution is to wrap the base of the tree with chicken wire or hardware cloth. This is an immediate fix as the beaver doesn’t want to test its teeth against the wire. There are also chemical glues available that discourage chewing, but the chicken wire/hardware cloth is simple and easy to remove when not needed. 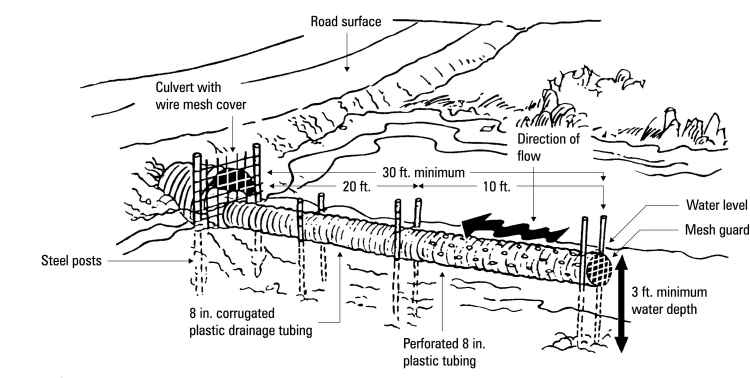 Beaver that attempt to dam culverts can often be thwarted by building a V shaped screen from one cattle panel and placing it on the upstream side of the culvert. You will likely need to anchor it with TEE posts. I am not really sure why the beavers don’t just dam up both sides of the V but they don’t seem to figure it out very often. These two diagrams demonstrate how a beaver deceiver works. Often the pond behind the beaver dam is desirable but the beavers just get carried away with their enthusiasm. A device called a beaver deceiver can maintain the pond at a reasonable depth. It is essentially a long pipe that goes through the dam. The intake end of the pipe is beneath the water in the pond and the beaver don’t perceive it as a leak in the dam. The deceiver can be sized to pass as much or as little water as you desire. This exact set up can be used in a culvert as well but won’t pass as much water as the culver can. I recently had a crew install a beaver deceiver on a large manmade pond. I was concerned that the beaver would dam up the outlet and perhaps cause the dam to wash out. The deceiver should keep the pond at a reasonable level. 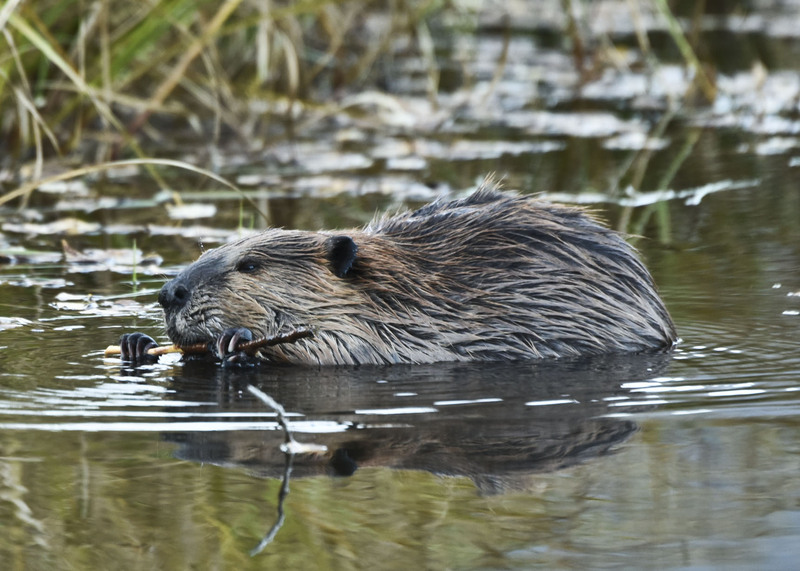 If all else fails, Fish and Game Departments are often willing to live-trap and transplant beaver to new homes in hopes of establishing new colonies and restoring more habitat. Call your local office to see if that is an option. If live-trapping is not an option, you may have to contract with a local trapper to remove the beaver. Except during the legal trapping season in an area open to beaver trapping, the trapper will have to obtain a written permit before removing the beaver. Although beaver can be a pain to land owners and managers, they are an incredible asset to natural systems. Learning to live with beavers is one of the smartest moves humans can make.